Hi friends! Today I’m sharing my thoughts on The Rainbow Science curriculum by Beginnings Publishing. 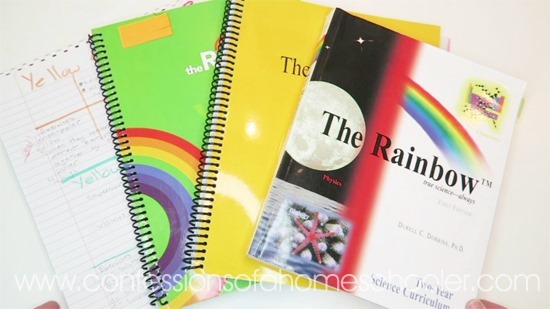 The Rainbow Science is a two year curriculum covering physics, chemistry and biology and is intended for use with 8th (year one) and 9th grade (year two). Last year we completed year one with physics and chemistry, and this year we’re going through biology. We do two lessons and one lab each week and it seems to be a great fit for us so far. We are really enjoying this curriculum and I definitely plan to use it with my younger girls when they get to 8th and 9th grade. You will want to get the student text book, teacher’s manual (which includes answers to text questions and labs), the student lab workbook, and the science kit for whichever year you’re working on. If you’ve started year one and want to continue with year two you just need to get a new lab notebook and the supply kit (durable and renewable kit) for year two. You will continue to use some items from the Year 1 kit, so make sure you don’t get rid of those! You do not need to purchase a new teachers manual or student reading text. I suggest ordering at least one student text book, you could always share if you have multiple students, but I find it easier if each of my kids has their own copy. You’ll also want to order one lab workbook for each of your students and one kit. We share our kit when doing experiments, but I suppose you could order one kit per student. I prefer to share since the science kit is always the most expensive part of any science curriculum. And like I mention in the video we’ve found it very useful to have the kit as it makes science a no-prep curriculum for me. I don’t have to plan anything ahead of time, we just open our book and get started. This course can be used as a Jr. High course or can be taken for two High School credits. You can receive one credit for Physical Science (Yr 1) and one credit for Biology (Yr 2). You can order your curriculum from Beginnings Publishing. If you have any questions that I didn’t address in the video you’re welcome to contact them, they’re very helpful! When I was homeschooled we used this for science! Best. Curriculum. Ever. I fell in LOVE with science because of this curriculum! Wish their curriculum for the younger years was ready for my son! I’ll definitely use them when my son gets ready for that level! Just wondering, if it’s a 2 year curric how do you note this for High School credit in 9th grade? From what I understand on your H.S. Transcript you can add that they did it in 8th or 9th grade depending on when you use it with your student. Also in our state H.S. is grades 9-12. The review and comments are exciting. I’ve heard about this curriculum and have been wondering what it’s like. I still need to order my science for this year, so I may try Rainbow. I have a question about the grades it’s used for, though. Your review says 8th and 9th grade, but on the book it says Jr. High curriculum. If it’s Jr. High, wouldn’t that be 7th and 8th grade? I’m asking bc my daughter is in 7th and I’m wondering if she should start this now. From what it says on their website you can use it for either jr. high or for two high school credits. Basically, kids can get credits for Physical Science (Yr 1) and Biology (Yr 2). 🙂 So your 7th grader will be fine as far as content goes. 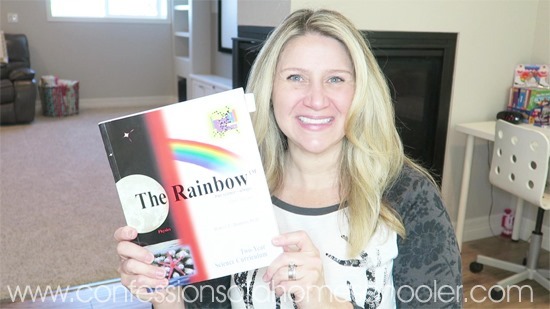 Hi, So I’m very interested in getting this rainbow science for my 12yr old. We started the year with Apologia general science. We have done astronomy with them last year and loved it. But not liking the general science at all. So my question is the rainbow science worth the money and better then the apologia in your opinion since you have done both? We bought the Rainbow Science book second hand, and the 1st year lab book for my 7th grader. I did not purchase the kits, as it looked like mostly dollar store items, easily purchased for less. It was irritating that there was no list of supplies either in the Teacher’s guide or the lab book. Each lab had a list of things you needed to use, but no overall list for the frugal parent. If you look on their website, they have a full itemized list of the supplies you need. Im sorry but I don’t see a complete list of items…..
Hi Sunny, if you visit their website you will see info for what you need. They sell a kit for each year, though I’m not sure they have a list of individual items on their website or not. I’m sure if you email them they can help. Thank you so much for this review! This is a serious consideration now for my 8th grader next year. I hadn’t heard of it before now. Have you heard anything from the publisher about The Colors? I would LOVE to have my 7th grader do that next year! One more question. My soon to be 8th grader LOVES chemistry and wants to do this curriculum but i’ve been hesitant about letting him do a chemistry specific science course because they all say that Algebra 1 is required (he actually struggles with math). What are your thoughts on this after having used this curriculum? Thanks! For this curriculum I think you could get away without Algebra 1 for the Chemistry portion. Do you happen to know if this curriculum has audio available to accompany the reading? My daughter has severe dyslexia so I have always helped her with the reading, but I am trying to help her be more independent so I am looking for a curriculum that is hands on but that has audio so she can do more independently. Thanks! I’m sorry, I don’t think they do, but you might check their website to see if they offer it and we just didn’t get it. Hello! I have a daughter that will be in “11th grade” next year. She had learning challenges (Dyslexia, APD, ADHA (Inattentive), Slow Processing, and Slow Working Memory. She learns best with visual and hands on curriculum. Do you feel this would be good for high school credit for a student that struggles/has learning challenges? I was also looking at Friendly Biology. We tried Rainbow Science for my son at the beginning of 7th grade after doing 2 years covering the 3 Apologia Zoology books (they love animals). After doing Apologia (wordy though it frequently was), my son thought Rainbow Science seemed really dumbed down, and thought the experiments were boring and stuff he already knew or could figure out. He preferred the Apologia General Science (though we all roll our eyes when the text says, “You’ll learn more about this in Biology”). We did Rainbow Science for 6 weeks, after which we realized that we were on track to finish it in one year instead of two, and that doing half the work didn’t feel like doing science much at all (and we’re 3 day a week homeschoolers). I dislike leaving bad reviews for things, but knowing what I do now, I would not have purchased this curriculum.